Reserve A Smoky Mountain Experience Today! The cabin was wonderful! It was very spacious and comfortable. The only con I would have is the parking. There really wasn’t much space for parking especially when the people staying in the cabin beside us came. Other than that my family and I enjoyed our cabin. This was a good vacation. The cabin superb. I don’t want to repeat what everyone has already said positive about this cabin. The best way to compliment the experience is by telling you that we are planning next year’s family Christmas vacation right now. We will be requesting the same cabin. We have been staying with Cabins USA for the last 5 years at multiple times during the year. We have brought family, friends, church people with us and they have always been impressed with the cabin and all the amenities that are in our package. The cabin is convenient, clean and very satisfactory for the people staying with us. Cabins USA is definitely a premier group for making visitors feel welcome and glad they came to Tennessee. We are booked again for November and are already planning our trips for 2019. Thanks for providing superior visits to the Great Smokey Mountains. Love being able to check in on-line. Wish that it was easier to get through the phone lines. We spent a lot of time on hold. But once you finally get through, the people are helpful and friendly. Very pretty and nice location. Will defiantly be coming back again. Nice cabin but didnt like the parking and driveway. The property and location were excellent for our needs. We had a wonderful experience and will definitely be back. Our only complaint was a grounds person weed wracking and throwing grass, potentially debris, on our vehicles including our son's new Harley motorcycle. LOVED this cabin. Governer's Crossing location is so convenient to everything. This is my 5th time staying in this area with Cabins USA. Everyone is always very friendly and the cabins are usually clean. We did have a few lady bugs in the bedrooms but I know that they do get in some how even after you clean. The cabin was spacious enough for everyone. My only complaint is that the parking lot has 2 parking spots for the cabin next door and they had taken up all of the spots the first night we got there. We didn't call on them because it was late when we got there and we were tired so we blocked one of their cars in. We thought that maybe they would come over if they needed out before we left the next morning but no one ever came and we moved the car out of the way before we left. This was on Thursday night. So Friday evening, we get a call that our car is blocking a parking space. I'm not sure if the cabin next to us called on us (which would be pretty crappy of them considering they took all the parking places) or if the cabin across the road called (which is still pretty crappy since we moved because the cabin next to us took all the spaces). I would definitely consider putting up parking signs for that cabin specifying that it's for that cabin only. We had to leave the Tanger outlets to go back and move our vehicle and this all could have been avoided if the cabin next door hadn't taken up all the spaces to begin with. Parking lot is only good for 2car. The upper bedroom TV to small and in the wrong place. Couldn't watch it at all. The pool table was off, need to be leveled. But other then that it was a great stay! Thank you for your review. We are delighted that you enjoyed your stay with us at A Smoky Mountain Experience. We apologize for any inconvenience you encountered during your stay, and we appreciate your feedback. We hope that we will hear from you again soon. Do not forget about our return guest discount. The cabin had plenty of room. We really liked the game room. The only issues are that all 4 beds were extremely hard, needs some attention to cleaning on the porches and parking was a nightmare. There is only enough room for 1 car and they were doing construction on the cabin next door and their trucks were always in the way. The cabin only has two guaranteed parking spots which is a little unhandy for us. My wife was having some arthritis issues which made our bed a little too firm for her. But otherwise, we found things good. We enjoyed our time there as we usually do in your cabins. Thank you for taking the time to let us know about your recent stay in A Smoky Mountain Experience. We here at Cabins USA strive to give each of our guests the best stay possible while vacationing in the Smokies. Thank you for choosing Cabins USA and we look forward to having you as our guest again soon! Super clean and super cozy cabin! Close to everything but in a quiet setting. Parking was tight but manageable. Loved that the cabin was not cluttered as we had a toddler with us. Would have liked to had some cleaning supplies (vacuum, dust mop) to keep floors clean for baby but we managed. Our older kids loved the hot tub, pool table and arcade game! We will definitely stay here again! The cabin was perfect for our families. It was in a great location and was very clean when we checked in. It was nice to be able to do your own cooking and laundry. But I would suggest bringing extra towels for the shower and pool. Washer and dryer were tiny so it was hard to keep up on towels with so many kids, but again, it was nice to have them. Pool area was very nice, pool was clean and perfect temp. We ended up there every day, it ended up being our meeting spot for all the families who were also staying in other cabins. My only complaint was the garbage cans not being big enough. We overflowed them before the first day was over and you have to call for garbage pick up. If they didn't come every day we were dealing with raccoons and had to clean up their messes every morning. Thank you for taking the time to let us know about your recent stay in A Smoky Mountain Experience! We here at Cabins USA work hard to make sure each of our guests have the best stay possible while vacationing in the Smokies. When you are ready to stay with us again, please mention you are a return guest for an additional discount. Thank you again for your review and thank you for choosing Cabins USA! The only real issue was that the beds were a little firm for our taste and the parking was very limited. The staff was very responsive, the amenities were great, and the cabin was clean. Thank you for all of your kind words! We here at Cabins USA strive to give each of our guests the best stay possible while vacationing in the Smokies. When you are ready to stay with us again, pelase mention you are a return guest for an additional discount. Thank you again for your review and thank you for choosing Cabins USA! Had to call for maintenance twice. A/C frozen up when we arrived. And frozen the next day also. Unit was very warm both days. Otherwise good time. We will return. Thanks. Thank you for taking the time to let us know about your recent stay in A Smoky Mountain Experience! We here at Cabins USA work hard to ensure each of our guests have the best stay possible while vacationing in the Smokies. I apologize for the issues you experienced with the air conditioning. Maintenance has been notified and will be addressing the issue. When you are ready to stay with us again, please mention you are a return guest for an additional discount. Thank you again for your review and thank you for choosing Cabins USA! The cabin was beautiful and the location was great. However, the main floor air conditioner was not working so this was a bit uncomfortable. Thank you for taking the time to let us know about your recent stay in A Smoky Mountain Experience! We here at Cabins USA work hard to make sure each of our guests have the best stay possible while vacationing in the Smokies. I apologize for the issues you experienced with the air conditioning during your stay. Your comments have been forwarded to our maintenance department to be addressed. When you are ready to stay with us again, please mention you are a return guest for an additional discount. Thank you for choosing Cabins USA and we look forward to seeing you again soon! This was our second stay with Cabins USA, but our first at A Smoky Mountain Experience. We really enjoyed our stay April 14th through the 19th. The location of the cabin is really great, and Cabins at the Crossing is a nice resort. The cabin was very nice, plenty of room with 4 bedrooms for our family trip. There are a few things we feel that definitely need to be worked on. The cleanliness of the cabin. At first glance it was clean, but the floors had not been mopped and there were many spots in the cabin that had not been dusted. Our 2 year old had very black feet after walking around the cabin for one afternoon. Next, the living room furniture is not enough seating. With it being a 4 bedroom cabin, and only one small couch and chair is not enough. Another small couch could be added to where the chair is and it would be great. Lastly, as we were packing our cars to leave on check out day, the cleaning crew was sitting outside the cabin waiting on us to leave. It was only 9 am and considering check out isn't even until 11, we felt very rushed. Overall, we had a great time and we would definitely return and stay at this cabin. We will be back next year booking with Cabins USA again. Thank you for taking the time to let us know about your recent stay in A Smoky Mountain Experience! I apologize for the issues you experienced with the cleanliness of the cabin. Your comments have been forwarded to our housekeeping supervisor and she will be addressing that with the cleaners as well as how early they were waiting at the cabin. Thank you again for your review and thank you for choosing Cabins USA! The location was great!! As always it was a pleasure to stay with Cabins USA. Thank you for all of your kind words! When you are ready to stay with us again, please mention you are return guest for an additional discount. Thank you again for your review and thank you for choosing Cabins USA! The cabin is very difficult to find after dark with the cabin name and number on the unlit porch. Adding something in the yard or at the driveway would be helpful. Also the parking is terrible if the cabin next door has many vehicles. The cabin itself and the location are wonderful. Thank you for taking the time to let us know about your recent stay in A Smoky Mountain Experience! We here at Cabins USA work hard to make sure each of our guests have the best stay possible while vacationing in the Smokies. I apologize for the issues you experienced in finding your cabin. Your suggestions have been forwarded to our Owner Liaisons and they will be be bringing that to the owner's attention. When you are ready to stay with us again, please mention you are a return guest for an additional discount. Thank you again for choosing Cabins USA and we look forward to seeing you again soon! The only negative to this cabin are the dishwasher needs to be fastened to the cabinet. You open the door to load and it means forward because not anchored. The blinds in living room need replaced. Not a good sight to step on porch and see broken blinds. Other than these two items really enjoyed the cabin. Thank you for all of your kind words! We here at Cabins USA work hard to make sure each of our guests have the best stay possible while vacationing in the Smokies. Thank you for letting us know about the dishwasher. Your comments have been forwarded to our maintenance department to be addressed. When you are ready to stay with us again, please mention you are a return guest for an additional discount. Thank you again for your review and thank you for choosing Cabins USA! We have been using Cabins USA for years, and have felt their prices and locations were great! However we were somewhat disappointed in the shape of this cabin. The heat and gas logs did not work when we got there, but maintenance was very quick to get it resolved. There was not enough seating in the living area for the # of guests, and the kitchen items were sparse and showed signs of use. The coffee pot didn't work and a sink and bathtub were clogged. Just not what we were used to from Cabins USA. The location was great and beds were comfortable. Very good location. Parking for 3 vehicles was not very good. But we enjoyed our cabin. Thank you for taking the time to let us know about your recent stay in A Smoky Mountain Experience! When you are ready to stay with us again, please mention you are a return guest for an additional discount. Thank you again for your review and thank you for choosing Cabins USA! We enjoyed our stay and are glad we decided to come a day early to enjoy the cabin. It was very comfortable. The only issue was a lack of not having someone provide clean towels daily. But I talked to the office, dropped our dirty ones off and they were out of washcloths, so they had several delivered to our cabin which we appreciated. Everyone in the cabin likes to use a clean towel and wash cloth daily. :) There were a few minor things that looked to be damaged before we arrived (did't bother us), I notified the office so they would know it was that way upon our arrival. They were very nice and said they would note the problems. We had a great trip and having been visiting the Pigeon Forge/Gatlinburg area for the past 27 years, sometimes more than once a year and enjoyed this cabin with our family. When we don't bring our RV due to the cold season, we stay in a cabin. It was our first time staying with Cabins USA and they have a great team working to provide good service. We had a great Christmas staying in The Smokey Mountain Experience. I am so happy to hear that you enjoyed your stay in A Smoky Mountain Experience! We here at Cabins USA work hard to make sure each of our guests have the best stay possible while vacationing in the Smokies. When you are ready to stay with us again, please mention you are a return guest for an additional discount. Thank you again for your review and thank you for choosing Cabins USA! The cabin was beautiful but our second day got a call to decorate the cabin no one ever came. The bedroom by kitchen leaked down the wall due to rain. Not enough amenities for the 8 of us called 3rd day there and said and again said they would send someone never happen. The cabin was very close too stores and downtown. We did enjoy our visit there overall. Very easy to book and very easy to get checked into the cabin! Love this company! We so enjoyed the cabin, parking was a bit of a problem, cabin next to us had 15 cars and not enough room to get out and in. Should consider more seating like a love seat or another sofa for more room to set for comfort other than dining room chairs. Move table over and angle the chair and put love seat by window at entry door. Upstairs sink was stopped up and slow to drain, ice maker was broken never made any ice, downstairs by the hall way and door where furance was had a leak kept carpet wet entire time. Express check in and out was nice. This cabin was perfect for my family. It was enough room and everything. I love that the thermostats are different on each floor. That really helped because we had elderly on the main floor. My only 2 complaints is that the ice maker didn't work and it leaked in the refrigerator and someone forgot tone empty the trash in the outside bin. We had to leave a bag of trash in the kitchen so animals wouldn't get in it. Check in and out was so easy. Only a phone call away. Also keep in mind there is only enough parking for 4 cars. It's a tight fit bc the cabin next to A Smokey Mountain Experience has 2 spots. I am so happy to hear that you enjoyed your stay in A Smoky Mountain Experience! We here at Cabins USA work hard to make sure each of our guests have the same great stay you enjoyed while vacationing in the Smokies. I apologize for the issues you experienced with the ice maker, refrigerator and trash. Those have been forwarded to our maintenance and housekeeping departments to be addressed. When you are ready to stay with us again, please mention you are a return guest for an additional discount. Thank you again for your review and thank you for choosing Cabins USA! The two bedrooms on the bottom floor were a bit small. The parking area was too small to handle the two cabins. (13 & 14). We enjoyed our time in the cabin. We did get in a little later than promised. The clean-up staff was still working at 4 pm. One of the children said that a video game machine was not working. Overall it was a good experience. The location was great! The beds were comfortable and the cleaning staff was very good. I realize that this is the busy season and it is hard to do maintenance but the dishwasher needs to be bolted down. We did not get in the hot tub because we didn't feel comfortable that it was drained between rentals. The express check in and departure was great. I will recommend you to anyone who asks. Thank you for taking the time to let us know about your recent stay in A Smoky Mountain Experience. I apologize for the issue you experienced with the dishwasher. Your comments have been forwarded to maintenance to be addressed. We here at Cabins USA take cleanliness extremely serious which is why each hot tub is drained and cleaned prior to our guests' arrival. When you are ready to stay with us again, please mention you are a return guest for an additional discount. Thank you for choosing Cabins USA and we look forward to having you as our guest again! Loved the cabin, most definitely will stay again. Beautiful Place. We had an amazing time as always. The movie channel was a plus. We had a great time but there were a few inconsistencies with the ad and slight things wrong with the cabin. The grill is not charcoal as listedin the ad, it is gas, which I thought was a plus. There is a space between the wood boards on the wall above the bed on the main level. This allows rain to run down the wall and it rained a lot while we were there. The decks only have one light on one end of them, which puts the other end in complete darkness. That just happens to be where the patio table is placed. We had no problem as we brought battery lanterns. The main problem would be parking. It was a tight squeeze with 3 cars, but would have been much worse if the cabin next to us had been occupied. Overall it was great. Clean, appliances worked, and very roomy for the 8 of us. Thank you for taking the time to let us know about your recent stay in A Smoky Mountain Experience! We here at Cabins USA work hard to make sure each of our guests have the best stay possible when visiting the Smokies. Thank you for letting us know about the wall above the bed. Maintenance has been notified and will be working to correct that issue. When you are ready to stay with us again, please mention you are a return guest for an additional discount. Thank you for choosing Cabins USA and we look forward to having you as our guest again! Loved the location and the cabin. The bathroom on the main floor was not clean (dirt accumulated in corners). Also, had to wipe the dining room table and bench off as you could see black on both, particularly the bench. Had to use clorox wipes to get it clean. The king bedroom on the main floor needs the comforter and sham cases washed. There was something white dried on the back of one of the shams. The bedspread in the bedroom on the left in the basement had a bad musty smell. Needs to be washed also. The only thing I can say was a down side was the upstairs master bedrooms blanket was torn and the down stairs guest bedrooms T.V. was not hooked up to the cable. Those two things were the only thing we found wrong with it. Otherwise we absolutely loved it and have already recommended your company to our family. Thank you for such a beautiful place to stay and expect us back next year! Thank you for all of your kind words and recommendations! The highest complement we can receive is when our guests tell their friends and family about us.Thank you for letting us know about the blanket as well as the bedroom television. Maintenance and housekeeping has been notified and will be correcting that issue. When you are ready to stay with us again, please mention you are a return guest for an additional discount. Thank you for choosing Cabins USA and we look forward to having you as our guest again! The Cabin was beautiful. The check in and check out process was a breeze. We didn't have to stop by the office to do either, which gave us more time to do other things. We will definitely be staying with Cabins USA in the future. A Smoky Mountain Experience was a great cabin and we loved the location but parking was the pits. It's a 4 bedroom cabin with only 2 parking spaces provided. Those spaces were squeezed in with 2 spots for the cabin next door which made backing out very difficult. I understand that there's not a lot of parking room but the cabin next door has a place for at least 2 cars in front so the parking between the cabins should be for ASME. We were told we would have to move one of our 3 vehicles to the street or park it behind Cabins USA and car pool but the cabin next door was a group split into two cabins and had 10 cars parked on site. I feel like there should be more parking rules explained before arrival. The TV in the master bedroom upstairs is at an awkward location. It is difficult to see because of the bed railing. Also the cover was off of the hot tub which we didn't use. It ran all night and needed water in the am. Otherwise we had a great time. I am so happy to hear that you enjoyed your stay in A Smoky Mountain Experience. When you are ready to stay with us again, please mention you are a return guest for an additional discount. Thank you for choosing Cabins USA and we look forward to seeing you again soon! Thank you for all of your kind words! We here at Cabins USA work hard to make sure that each of our guests have the same great stay you enjoyed while vacationing in the Smokies. When you are ready to stay with us again, please let our reservationists know you are a return guest for an additional discount. Thank you again for your review and we look forward to seeing you again soon! Our family had a great time at the cabin, it was commodious and clean. The pool area was also very well kept. All of the appliances were functional, and the gameroom downstairs was a real hit with the kids. It was also terrific to have so many bathrooms available too. We will definitely plan on returning in the future! Thank you so much for all of your kind words! We work hard to make sure that each of our guests have the same great experience you enjoyed while vacationing in the Smokies. When you are ready to stay with us again, please let our reservationists know you are a return guest for an additional discount. Thank you again for your review and we look forward to having you as our guest again! We LOVED the cabin. The only downfall was the parking The large cabin next door hogged up all the parking so we could barely get our vehicles into the cabin, if we had have taken trucks I don't know where we would have parked. I finally decided we would park behind them and if we blocked them in so be it. There really should be at least two designated parking spaces for the cabinsusa cabin. The other cabin had 7 vehicles. Please consider posting desgnated parking for this cabin. Only other complaint was the outside back decks were dirty with a lot of cobwebs hanging, but that was no big deal. Really enjoyed the downstairs game room and the hot tub was awesome !!! Thank you for taking the time to let us know about your recent stay in A Smoky Mountain Experience and I am so happy to hear that you enjoyed the cabin and all if it's amenities! I apologize that the decks were not cleaned. This has been forwarded on to our housekeeping department and we will be address this with the cleaners. Your suggestion about the parking has also been forwarded on to our Owner Liaisons. We are constantly looking for ways to improve our guest's experience with us. Thank you again for your review and thank you for choosing Cabins USA! The cabin was beautiful. Perfect for our needs. The only downsides were the arcade game downstairs was malfunctioning (moving the joystick down wouldn't work), the cuesticks and balls needed to be replaced for the pool table, and the garbage bin needs to be secured better. The raccoons loved my fried chicken so much that they were able to lift the door on the bin and get inside. In cabin was everything we hoped it would be. We arrived at 3:25, check in was at 3, but we had to wait a few more many because they clean company was still there cleaning. We knew that there was a change that the Hot Tub would not be ready when we arrived, due to the fact that it is cleaned every time a new guess arrive. What we wasn't expecting to do was have to out water in there everyday due to the tub having a leak in it. Since the clean people was still there when we arrive, we didn't have to use the code lock to enter the cabin, so once we left to go out and arriving back at 11pm that night, we wasn't able to get in. After calling the after hour number, we were given another code because the other one was wrong. Other than a few minor things, everything was okay. I would recommend this place to everyone I know. The only issue we had was parking. We had a cabin directly beside us and when we arrived, they were under the assumption that all parking spaces (in front of cabin and on the side) were for their cabin only. We were all able to work this out ourselves but I think this is something that does need to be addressed. Thank you for taking the time to let us know about your recent stay in A Smoky Mountain Experience. I apologize for the parking issues you experienced and I will let our reservationists know about this so they can make future guests aware. Thank you again for your review and we look forward to having you as our guest again! The staff was great!!!! Our only complaint would be the mattress in both bedrooms downstairs they really need to be replaced! Beds were not comfortable. Thank you for your kind review! Our staff appreciates it when they're recognized for their outstanding customer service. Thank you for letting us know about the downstairs mattresses. Our Owner Liaisons have been notified and will be speaking with the owner of the cabin about it. Thank you again for your review and thank you for choosing Cabins USA! Our stay at cabin USA was terrific very quite and relaxing . I will definitely come back again..
Everything was great. The only thing we thought could improve was the seating in the living room . There was eight of us and we all couldn't sit together, Maybe another couch or loveseat would be perfect. A large lamp would help also in the living room. We look forward to our visit with your company. We have visited Pigeon Forge At least once a year for over 20 years and you are the BEST rental co. we have ever used. Thank you for your review. We are glad that you enjoyed your stay with us. We greatly appreciate your feedback on your stay with us. We look forward to seeing you again soon. The cabin next door was very large and they took all of the parking. I believe it should be marked for each property. The house was very nice and very well equipped. Thank you for your review. We appreciate your feedback on your stay with us at A Smoky Mountain Experience. We hope that we will hear from you again in the future. Thank you for choosing Cabins USA. Thank you for your review. We are glad that you enjoyed your stay with us at A Smoky Mountain Experience. We look forward to seeing you again soon, and we do offer our returning guest an additional discount. We look forward to hearing from you. We loved the cabin and location.the only problem we had was the people in the next cabin taking the parking spaces making it hard to get in or out of the cabin. We found the cabin to be comfortable and it had plenty of room for our family. Were highly disappointed that we had water in the bottom floor when we arrived. This should have been reported by the clean up person or previous family that stayed in this cabin and been taken care of before we arrived. We called and reported this problem on the day we arrived. I would say within the hour of arriving we saw this problem and called the main office.After several calls and going to the office this was finally taken care of. Other than this we enjoyed the cabin:-) this was the 2nd time to stay in this cabin. Thank you for your review we are delighted that you enjoyed your stay with us at A Smoky Mountain Experience. We apologize for the issue you experienced during your stay. We would have called you once it had been reported; however the leak must have started after our cleaners had left. Again we apologize for the inconvenience, but are glad we were able to address the issue in a timely manner. We hope that we will hear from you again soon. Do not forget about our return guest discount. we certainly enjoyed our stay with USA as we always do. The only thing was the Fireplace in the Living room did not work. we would have used it one of our days as it was cold. you may want to get this working before next fall. not many will use it over the summer. Thank you for choosing Cabins USA, and we appreciate your business. We are delighted that you enjoyed your stay with us at A Smoky Mountain Experience. The fireplaces are seasonal and we do have them turned off by the end of March. Again, we appreciate your feedback and we look forward to seeing you for your next Smoky Mountain getaway. Thank you for taking the time to review your stay with us Lindsay. We are delighted that you enjoyed the location and the cabin A Smoky Mountain Experience. We appreciate your feedback on a couple of issues that you experienced. We do spray the cabins monthly, and we also spray them as soon as we are aware there are any insects or bugs in the cabin. We hope that you will think of us as you are planning your next vacation to the Smokies. Thank you for choosing Cabins USA. Thank you for informing us of concerns you had with the cabin. We will definitely look into the issues. We hope that we will see you again soon. This is the fourth year that we have stayed with Cabins USA and our third time in this cabin. We love the location as well as the accommodations. We have always been pleased with the service we receive each time we come. Thank you for such great service. Cabin is dated and furniture is very uncomfortable. TV 's need updating too. This was a very nice cabin; it does need internet service; and extra towels need to be provided. For 12 people there were not enough towels and wash cloths and the washer and dry needs to be larger to accommodate 12 people. We had a great time and the cabin and service were very nice. We will book again, when we return to your area. Thank you for your service. Loved the location and the cabin, I would like to make two suggestions, one is to pressure wash the decks, they are a bit dingy and would look so much better if they were cleaned. I also would like to mention that the TV can not be watched while lying in bed in the upstairs bedroom. That needs to be fixed. Other than that, this is a great cabin, lots of space and a great location. We will be back. The staff at check in was extremely friendly, smooth check in. Easy check out, just a phone call. The cabin was comfortable for our family, plenty of room in the bedrooms & baths. The kitchen & living room area was not as large as other cabins we have stayed in, could have been s/w larger. Also, not as much cookware as we have had in the past. The cabin needs a thorough cleaning ! We found many areas that hadn't been cleaned in a long time! Parking was not good, we only had 2 cars, but the cabin next to us had 6, so they took up most of the parking. Don't know where we would have parked more cars for our family. Over all, we enjoyed the stay, but a good cleaning would have helped! My family and I always use Cabins USA when we visit the area which is 2 to 3 times a year at least. We truly enjoyed this cabin because we had our youth group with us. It was about 15 in all; three adults and 12 children. There was more than enough space and sleeping spots. Besides the beds in the bedrooms, the living room and gameroom had pullouts. They boys especially enjoyed the hot tub, pool table and the video game; we love Pac-Man!!! 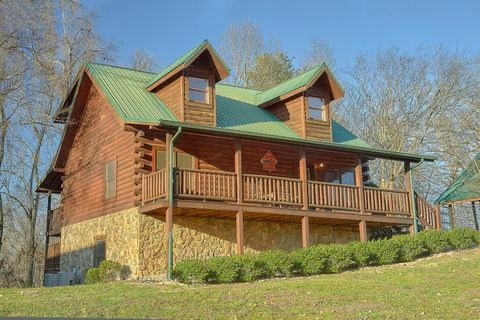 The cabin is located in the middle of everything whether you want to hang out in Pigeon Forge or Gatlinburg. Not to mention that it is super close to Tanger Outlet. The children truly loved this cabin and their ages range from 5-17. One and only negative..........If you plan on cooking big meals, you MUST bring your own pots and pans. Kitchen is not well stocked for that purpose. We have stayed several times with Cabins USA. This cabin was in great location and well kept. Enjoyed our stay. Also, the company was great by changing our cabins when the first one was not well kept or as clean as Cabins USA standards. The cabin needs a good deep cleaning. There is a lot of dust & cob web build-up. Overall, we were pleased, and we enjoyed our stay there. The location is convenient. We rent from CabinsUSA quite often and enjoy our stays in their great cabins. WE HAD THE BEDROOM UPSTAIRS, AND THE TV DIDN'T WORK. AND OUR SHOWER LEAKED DOWN THE KITCHEN WALL. BUT WE AIN'T THE TYPE TO GET ALL BENT OUTA SHAPE OVER THIS. OVERALL, WE ALL LOVE THIS CABIN, WE HAVE STAYED IN IT BEFORE, AND HOPEFULLY WE WILL AGAIN!!!!! We loved our weekend with our 4 couples, and this cabin fit our needs perfectly. Great location...we have rented in this area for the past 5 years with Cabins USA and love it! Maintenance man was fast to come after we called when the gas logs were not working. Will be coming back, hopefully with our usual 8 couples next year! We all enjoy staying in the Big Bear Lodge too! Great place for relaxing. Wish it was a little further remote from Pigeon Forge. Thank you for choosing Cabins USA. We are happy to see that you enjoyed your stay. We do hope that you will stay with us again soon. We are a blended family who came together for a weekend. It turned out to be a wonderful weekend. I had read some of the reviews ahead of time so I knew what things I thought I would have to supply (kitchen utensils). There was plenty of room, hot water, and the best game room. The parking was tiight but it worked out ok. The one thing I thought you might need to know, the hottub was low on water. Other than that, everything was great. Everything was great. I will recommend Cabins USA and I have already recommended you to others. Everything about our stay was great. Would encourage stocking the kitchen a bit more. We found cooking a challenge with limits to baking dishes. Now that we are home, wish we were back! would like to come back and stay there.. thanks.